If you have ever been around a hot tub you know the familiar chlorine smell of the water. Chlorine and bromine are the two most frequently used chemicals in hot tubs, spas, and pools because they help to balance the pH of the water and keep algae and germs from establishing a home in the water. You know that you want clean water, but you may hate the smell of the chlorine, and some people have sensitive skin that is affected by chlorine and bromine found in spa and hot tub waters. It is possible to maintain your hot tub without using any chemicals, but you will have to be a little more diligent with your care in order to keep your water balanced properly and healthy. An ozonator is designed to inject the water with ozone and the effect is a protective barrier just like the ozone layer around the earth. These ozonators have been reported to be as much as 3000 times more effective that the chlorine and the bromine chemicals are. An ozonator may not be the perfect idea for all spas and hot tubs because many of these units have to be modified before you can use the ozonators in them. The ultraviolet rays of the sun are very powerful and helpful to your spa water in the fact that these rays are able to stop the growth of many types of bacteria and algae. So you may want to consider removing your spa or hot tub cover and letting the sunlight infiltrate your water. Sunlight can have a damaging effect on chlorine and bromine and can even cause you to have to add more of these chemicals. So if you use chemicals to treat your water make sure you know how the sunlight will affect them prior to exposing them to hours of unfiltered sun rays. People who are sensitive to the odor of chlorine or to the chlorine may want to choose to use a non-chlorine shock to treat their spas and hot tubs. The non-chlorine shock is sold anywhere pool chemicals are sold and it works just like the chlorine shock does, it just does not have the smell of chlorine. 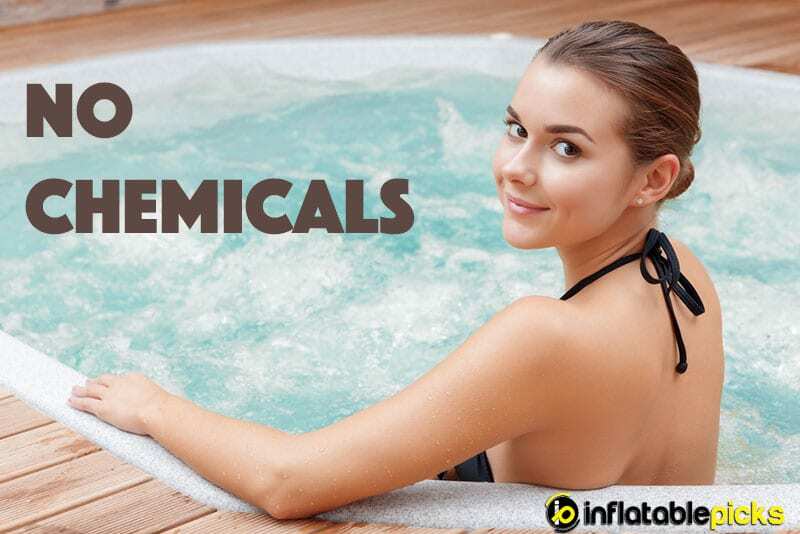 If you want to reduce the amount of chemicals you add to your spa or inflatable hot tub then you should keep the filter of your spa or hot tub exceptionally clean. The filter is the main way that dirt, foreign matter, and particles of debris are removed from your water so you want your filter to be operating at its peak performance ability. Another method of reducing the number of chemicals you place into your spa or hot tub is for you to completely drain and clean the tub on a more frequent basis. These cleanings will remove a lot of the bacteria that can cause the algae to start to grow on the sides of the tub. Copper and silver are two places where you can find mineral sanitizers that are very effective at killing the things that are contaminating your spa and hot tub water. When you add mineral sanitizers to your water you will not have to use as many harsh chemicals to keep the water in balance and free of bacteria. Many manufacturers are retrofitting their spas and hot tubs so they can be operated with salt water instead of with clear water. The salt water does not have the same tendency to develop bacteria and algae growth as the clear water has. You only add the proper salt to a salt water system instead of adding chemicals like chlorine and bromine. Your spa and hot tub are going to have to have some cleaning and proper filtration in order to keep the bacteria and contaminants out of the water. Many of the cleaning methods, like the salt water method, can cause people to have dry skin conditions, and can irritate sensitive skin, eyes, and hair. It is recommended that you bathe prior to getting into your tub either a bigger one or for a two person hot tub so that you remove natural skin oils and cosmetics that can contaminate the water and encourage bacteria growth by upsetting the pH balance in the water. Do not apply hair spray, hair gel, or hair products prior to getting into the spa or hot tub so you do not contaminate the water. Do not allow people to eat or drink while they are in the spa or hot tub because spills of food and drink can upset the pH balance and increase the possibility of bacteria causing algae to form on the pool or in the pump of the unit.